BERLIN – Andy Warhol. Erte. Ilya Bolotowsky. Not names you’d typically associate with Berlin. The connections behind a new downtown gallery want to change that. Salisbury couple Foster and Lisa Schoch will be sharing their collection of 20th century art with the public at Art in the Fields. The gallery, located on Main Street, is expected to open later this month. She and her husband have spent the past several months renovating the former Mid Atlantic Pain Medicine building at 6 S. Main St. By the end of July, they hope to have the interior space opened up and the walls covered in modern art. Unlike the numerous Berlin shops that feature work by local artists, Art in the Fields will showcase work by internationally known 20th century artists. The first exhibition will feature the Sunday B. Morning prints of Andy Warhol—including the iconic Marilyn Monroe and Campbell’s Soup prints. “We’ll have a huge collection of Warhol,” Schoch said. 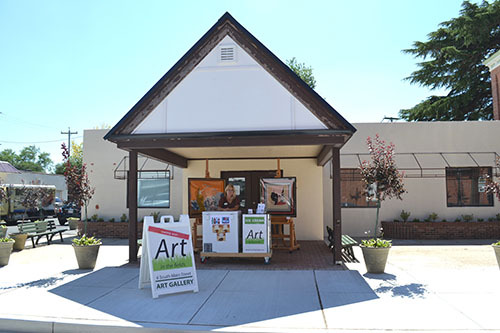 It was Warhol who inspired gallery manager Kelly Lehman to set up a stand selling ice cream and soda outside the gallery as it undergoes renovations. Lehman has been selling ice cream and answering inquiries from numerous passersby the past few weeks. Many of them are surprised to learn that the gallery won’t be full of original local art. Instead, its walls will be covered with the work of Warhol and his contemporaries. Schoch said she thought the gallery would better complement Berlin’s existing shops if it sold something they didn’t. She said the gallery would consist of two areas. One will feature a monthly exhibit — such as Warhol’s — while the other will include a variety of the work from the Schoch’s collection. Lehman, who spent three years working at the Philadelphia Museum of Art, will be on hand to answer any questions visitors may have as they browse the work, all of which will be for sale. The first artist to be showcased at Art in the Fields will be Warhol, but after that work by Erte, the artist and fashion designer known for his Harper’s Bazaar covers, and Ilya Bolotowsky, a Russian American abstract painter, will be on display. For more information, visit www.artinthefields.com.